Power Cut includes discs for rail cutting with power saws. There are available in two different specifications (soft and hard) to satisfy every need. When cutting rail, best results come when discs are used at their maximum speed. to avoid rail overheating, disc consumption or bursting please do not apply too much presure. It is highly recommended to wait at least two minutes between two cuts on the same piece. 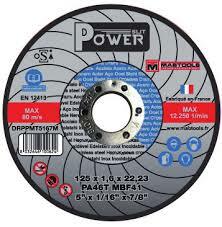 Mabtools manufactures cutting discs for stationary machines and power saws for industrial applications. Discs are classified according to: Type of machine (cut-off machine, chop saws, power saws); maximum operating speed (80 and 100 m/s); workpiece material (steel, stainless steel, stone and concrete). power cut discs are designed to ensure the safest working conditions and to avoid the most common problems: slow cutting, fast wear and vibrations.